A few weeks ago, my wife and I got a chance to get away for the weekend. On our way to the hotel I realized that I had forgotten my razor. We were passing a shopping center at the time so we pulled in and I spotted a Dollar General store. I went in and bought a $1 pack of razors. A commodity product, down economy, it was necessity; so I figured it was a good decision… until I used it. The only way I can describe the experience is to say that I couldn’t tell if the razor had a blade on it until it sunk deeply into my skin. It skipped over some parts of my face and dug in on other areas. I had nicks and cuts everywhere; I looked like a schoolboy after his first shave. The lesson I took from this is that sometimes I think you have to feel the pain to understand and/or appreciate the value of quality. From what I have observed lately, I believe companies are starting to, or will come to this same realization. We’ve all cut back to weather the economic storm. Are companies doing a much better job at managing costs now? Absolutely. Have they finally made the cuts they should have made a year ago? Yep. Have they perhaps gone too far with some of their cost cutting? We’ll see. What’s important to remember about this economic downturn is that it started in 2007. It’s only gotten dramatically worse in the past six months, but many companies started cutting back long before the current “crisis” hit. As a result, three or four rounds of adjusting cost to meet declining revenues have already occurred. The fat got cut a long time ago. They cut into the muscle around mid-year last year and now are cutting into the bone in many industries. If you’re a vendor or service provider like us, you may have experienced this first hand. But hang in there; I believe that companies will return to quality providers. It’s only a matter of time before the results of the “nicks” and “cuts” really begin to hurt. Each company has a different tolerance for pain, but when, for example, the “cost saving” decision to change your outsourced customer service provider leads to rising customer attrition and declining service levels, those “cuts” will begin to sting. When this happens, and customers can see recovery on the horizon, they will come back to quality. The question you need to ask yourself is; has your organization created the $1 razor? With all the cost cutting, is your product/service at the same quality level and/or can you deliver the same customer experience. When customers do return…so do their expectations. Be careful, during an economic downturn the price/value equation can become unbalanced. Like many companies, you’ve probably created a lower cost, stripped down model, hoping to gain or hang on to market share. If customers return with smaller budgets, will they adjust their expectations of value as well? Should they expect less? Probably, but will they? Not unless you manage their expectations. Adjustments will have to be made, and it will not be a smooth shave. You may already have the “nicks” to prove it but don’t let your customers end up feeling the pain. In August 1999, Selling Power magazine ran an article featuring our firm and the work we’ve done helping clients, like IBM, build new sales channels and increase sales productivity. A few months later, we received a call from the head of a division within NCR asking us to meet with them to see if we could help them with something similar. After collecting the previous project work we quickly went to work on assessing what had gone wrong. It took us a while, but we finally discovered “IT”. Once found, this insight became the key to unlocking success. Almost ten years later I’ve seen this scenario play out over and over in B2B companies. This is what we discovered. This simple equation is just as true today as it was a decade ago when we discovered it. Oh, you may find one or two exceptions but the majority of the time when we do post mordem on failed programs you find this equation is at the heart of the problem. When combined with a few related pieces, like a lack of time in the market and/or funding, the initiative is doomed. The degree of “newness” in these three areas will directly impact the likelihood of success or failure. 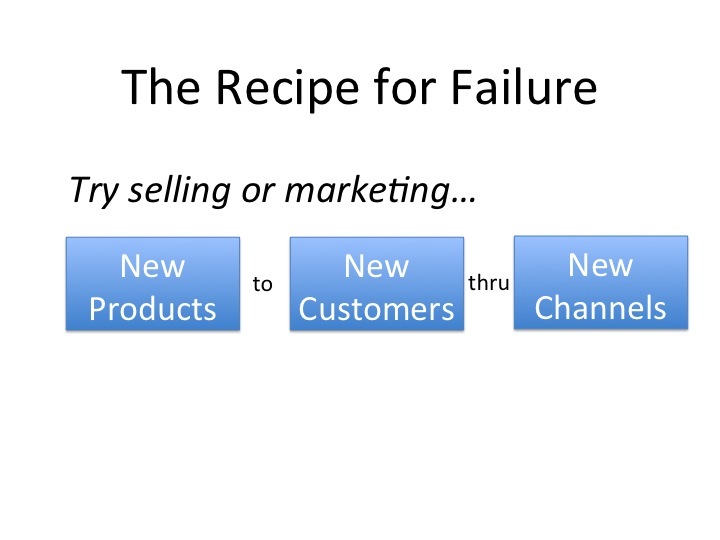 Why they fail – new sales channels fail because companies aim new channels at the wrong targets — new customers/markets. An investment in a new sales channel means that it is competing with existing channels for funding. If it does not hit expectations/goals quickly, it will be robbed of the necessary funding and/or resources needed to make it successful. How to improve the chances for success – The most successful way to build a new sale channel is to do exactly the opposite of what is described above. Shift coverage of existing customers or products to the new channel and use your existing channels to go after the “new.” Shift dormant or flat growth customers to the new channel to give it revenue immediately and free up your existing most knowledgeable, best trained sales folks to go after new opportunity. Why they fail – new marketing campaigns promoting new products aimed at new customers typically fail because of reasons listed above…they take too long to produce and/or aren’t given the time. Here’s another common problem, agencies will tell you the problem is the “creative” or “value prop”…maybe, but they also could telling you this because they make money on creative and production. “New” works with their business model. How to improve the chances for success – build less individual campaigns and invest more in one or two long term programs with many integrated tactics. Keep the programs in the market longer, closely monitor them and modify tactics based on performance. You don’t need a new campaign every month, you need a program that produces…and with tight budgets this will help you be cost effective/efficient. Years ago we did an assessment of campaign performance at IBM. We found that the highest performing campaigns had at least 7 integrated tactics and stayed in the market for at least 6 months. Use this as a starting point to design your campaigns and programs. New to New thru New – level set expectations and invest for the long haul. You will need time and commitment to make it successful. Companies have short-term horizons that are getting shorter every day. If you’re going to lead this effort get everyone to agree on what defines success and stick with your timeline. New Product/Service/Solution – try to leverage existing channels, customers or both to start…then migrate to new. This way you can learn if you have the right value prop, messaging, pricing, etc. We like to take existing reps, for example, and use them to help launch a new sales channel, like Tele. We like to use existing customers to test new products, etc. We got the NCR teleaccount program up and running in 41 days. We transitioned existing field account managers to TeleAccount managers and built their territories around their customers. We then began to backfill them with new lower cost resources over time. You’ll be happy to now that the manager of the group that tried to sabotage the effort got fired. The program hit our first year sales targets, reduced the expense to revenue ratio from 13% to 6% and grew sales productivity from $1.7M to $3.1M per rep. As a result, NCR then built a full-scale tele channel with close to 80 reps.
Then they killed it. It’s a long story but the bottom line was the company has a strong field sales tradition and culture. Mark Hurd, now CEO of HP, became the CEO of NCR, and decided to shut the channel down, redirecting the resources to the field. Remember my comment about competing for resources. Mark’s an operations guy and a fan of face to face selling. Culture runs deep, and can also kill channels and programs. Maybe I should update the “recipe” to include the forth “New”…new leadership. My inbox is full of resumes of good marketers that I’ve been fortunate to come to know or work with over the years. Solid people, with great experience who are now having a challenging time finding new opportunities in this incredibly difficult economic environment. Many of these people could have had their pick of jobs as recently as last year. Given the situation, I thought I’d try to help by providing a viewpoint on what skills set, background and experience companies will be seeking once they start hiring again. I’ll use two data sources to make the case. A few years ago, we teamed up with a professor (John Josephs)at Kellogg on a couple of research projects aimed at getting a better understand of what creates a high performance marketing organizations. Internally, we thought of it as the “head” and “body” studies because we first studied the marketing organization (the body) and then the follow year CMO’s (the head). 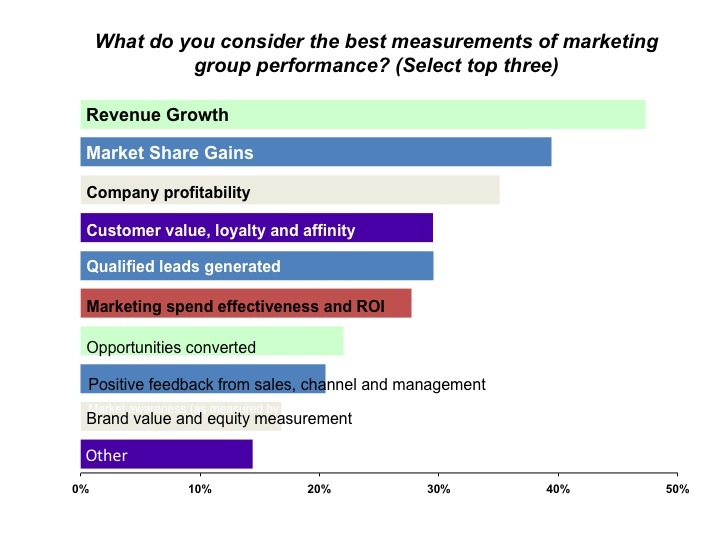 We surveyed not only CMO’s and marketers, but also CEO’s, about their views on what makes marketing effective. The research was then published by the CMO Council. Here are a few things we discovered along the way. This information is a few years old now, but I can tell you that based on client work that the down turn has done nothing to change this, if anything, it has placed greater importance on the top 3-4 responses. Keep the top responses on these charts in mind as we move to the next section. We were interested in assessing their area of expertise, experience and tenure. Although executives with Product Management and Sales Enablement/Demand Gen experience represent only 27% of the total group, they represented a disproportionate amount of executives with the longest tenure. In fact, they were twice as likely (as a representative percentage) to be in the 2-5 years tenure category than those with Brand, Advertising and Corp Comm backgrounds. And they made up half of the individuals in the more than 5 year category. Another interesting thing we picked up is that markerters in the NYC area were more likely to be new in role versus other regions (higher than average churn…probably attributed to a higher supply of talent). Spencer Stuart has for many years reported CMO tenure rates (less than the life of a gold fish) but I’ve never seen them look at tenure by background…which makes a difference based on our assessment. Finally, let’s look at Supply & Demand. The Top 20 Advertisers in the US have been decimated. Think about…half of the Top 10 advertisers in 2007 were automobile manufactures. As a result, agencies have put hordes of people on the street.GDP in Q4 2008 is estimated to have declined by 6.2% from Q3 that declined by 0.5%. Revenues are down on average of 30-40% from the prior year in most firms (at least the ones we work with). As a result, there are a slew of marketers with advertising, branding, and corporate comm backgrounds (73% of the database that we analyzed) in the market. Conclusion– potentially high demand and a low supply of marketers who can drive revenue. The marketers that will be in the highest demand coming out of the recession will be the ones who have been aligned or have had direct responsibility for growing revenue. Marketers that can speak the language of sales. Unfortunately, it will be a slow process for folks with a Brand PR and Corp Comm or the Ex-Agency/Media guys.Marketers with backgrounds in Product Management/Marketing who have owned a P&L, folks with sales backgrounds and/or marketers who can show that they can drive revenue/growth will be in demand first. The challenge for the other groups is that of supply. It’s not to say that good Brand and Agency folks won’t find positions it’s that it’s going to be hard. Expect that you will be competiting with many other qualified candidates and it may be difficult to differentiate yourself. Pipeline slowed to a trickle? Opportunities backing up, lead-to-close time seem like forever…yea, welcome to the recession. With customers delaying and/or postponing decisions altogether the ol’ pipeline ain’t what it used to be. Weekly Pipeline Meetings with Sales AND Marketing – yes weekly…and with Marketing, do it in country and at the region level. You may also do it at the corporate level with the CEO , like IBM. 90 day Movement Limit – this is one of my personal favorites. If a lead (that is truly a lead) does not advance within a 90 day window it moves back to the previous stage in pipeline or is killed. Given that lead cycle times have lengthened…considerably, you may want to make the window 120 days. Up or Out…learn it, live it, love it. Define a lead and stick to it – look, it’s going to be difficult road but be honest with yourself on what is truly a lead. A response to a campaign offering a free gift card, or a download of a white paper off the website, aren’t leads…they’re responses and should be treated that way. Leads are defined by meeting a BANT criteria…see above. People will want to get fast and loose with the facts to satisfy the sales force or make marketing targets but don’t let them…stay firm, you’ll thank me when the recovery starts. Response Management – so now that you’ve removed the “junk” out of the pipeline it’s time to do something with it. In reality responses aren’t “junk” (well, some are), they’re potential leads that just need to be nurtured…for a long time in today’s environment. Don’t disregard them, I’ve seen too many companies do nothing with this group. In the good times most of them would be leads. How to find them? Simple, ask this question during you pipeline call; “who owns responses that aren’t qualified leads…” wait for the silence. Bingo, there’s your answer. Take the last 6 months of campaign response and start digging. Lead Gen to Sales Enablement – it’s time to move marketing down the pipeline. Lead generation aimed at acquiring new opportunities is a waste of money in a recession. The cost of a qualified lead has skyrocketed…don’t believe me go do the analysis you will be surprised and in some cases shocked. So it’s time to invest against sales enablement and helping the sales force move opportunities already in the pipeline. Here’s another fact for you…B2B sales channels create 80-85% of all leads so cutting lead generation programs will not hurt you…I’ll say it again, redirecting investments away for lead gen activities will not hurt the pipeline. What is sales enablement, and how does it help the sales force? Well, it’s things like business tools that can prove a ROI, sales presentations loaded with proof points (case studies) on your value, and a robust customer reference program (see the graph above). By aligning marketing activities to moving the BANT levers you will be investing marketing dollars were they can have the greatest return…and your sales force will thank you for it. Comp on or Emphasize Customer Meetings – if you build comp plans based on revenue and lead targets/production you may want to consider over emphasizing face time in front of the customer for the first half of the year. You’re probably saying to yourself, “but Scott, why would I do that if customers aren’t buying?” Right, but they can tell you why, when things might loosen, and who you need to get to (see my rant on BANT in bullet #2). It’s during these times that you need to have your reps in front of customers so they can collect the information needed to provide you with update during the weekly pipeline call. Use your sales enablement team (see paragraph above) to provide them with high value material to share with customers in order to get those meetings. See how it all connects? I hope this helps. Unfortunately, it looks like we’re going to be stuck in this situation for all of 2009. Be strong…the bad times, just like the good times, don’t last forever. Tell me if you’ve seen this movie before. After spending months debating about the right type of segmentation to do, you finally agree, do the research and…it never gets used. Or how about this one, you get a request from sales for information you’ve already sent to them…multiple times. It’s a horror movie and it gets play out every day in organizations all across the country. Why is it that we want “data” but then we don’t end up using it? Based on my experiences with clients, I believe it comes down to few common problems that are manageable, if known. Actionable Insight – as in the lack of it…it’s the #1 reason why data doesn’t get used. Far too often the Ph.D’s will put out data without having interpreting it for the intended audience which then sets up the next problem. Language/Communication – call it taxonomy, communication style, whatever, data folks and everyone else (in particular, sales & marketing) speak different languages. Overload & Timing – yes, analysis paralysis does exist but not the way you might think. If you’re in a data rich environment, you’ve probably experienced this. Just too much info flying around and as a result, it often gets ignored. It’s not that it causes people to not take action, as much as it is people taken action and ignoring the data. In other situations, especially involving marketers, it may be a matter of timing. They may be in too much of a hurry to get something out the door to wait on the data. 60-70% Complete – critical pieces are sometimes missing so you can’t see the insight. The dots haven’t been connected. The person responsible for supplying the data doesn’t, and/or wouldn’t, see the connection. Skill set – CMO’s when asked the top reasons (see the chart in the post below) for the need for new skills in their organizations mentioned; “greater segmentation of market” and “increase demands for analytics” in their top 5. The problem is that there aren’t many of them out there. Why is this important now? Because everything you do or want to do, or are thinking about doing, will have to be backed by data in this economic environment…you’ll need a rock solid reason for getting, or spending a budget. Help connect the Dots – if the story is missing help supply/coach on how or where to connect the other pieces. If you’re the user know what you’re looking for and provide guidance on where to find it. As I mention above, researchers may not know or wouldn’t understand the connection. This also applies to coaching on communication. Help them understand the language you speak. Chunk it up – sometimes there is just too much to take in and process. Chunk information into more digestible pieces. Take some time and think about what various groups can digest and how often…especially if you’re in a data rich environment. Provide plenty of lead time and direction – don’t expect to get something insightful and/or useful if you don’t give adequate notice or direction. Getting a report on market share won’t tell you how to increase it, or why you’re losing it. Combining trended quarterly market share, key consideration drivers, and sales coverage will…but it takes time to collect. Know what you’re looking for and how to get it. Hire an expert – as was mentioned above there is more demand than supply of talented people who can pull insight out of data and drive action from the insight. If you have to, partner with a vendor. It should also help with the timing/speed issue mentioned earlier. Additionally, they will have tools/approaches that help force out insight. Data…leads to Insight…leads to Action…leads to Data…the cycle of life. It’s time to turn this horror movie into an action thriller. Will Companies be able to Create a Trend? What if you could create a trend that could make your product “THE” hot product? Think it’s impossible? Maybe now, but in less than two years it will happen. I saw something a few weeks ago that gave me chills when I thought about the potential uses. The tool is…in a sense…the world’s largest and most sophisticated digital listening device. It was built to monitor chatter by those “not so friendly” folks that see the US as the “evil empire”. (Let’s just say that Homeland Security has got this one nailed.) Yes, other companies have similar tools but nothing reaches the size, scale and scope of this one (consider this, it has archived ALL the web pages in the ”www” for the last three years). Anyway, we’re helping to develop a commercial use for the tool and I as was watching the demonstration, I couldn’t help but think about Malcolm Gladwell’s book The Tipping Point. Many of the concepts he wrote about, I was now seeing play out in real life. This gigantic ear could easily determine who the “connectors” of the digital world are (in real time), “The Power of Context” as Malcom refers to it (in over 20 languages), and when something is going “viral”….all with very sophisticated algorithms and complex math. It got me thinking, could it also determine how to create a trend? According to the team that developed the tool , it can’t yet because it doesn’t assess and/or integrate a number of important factors needed to understand the audience and what drives behavior. But if you combine the power of this tool (and other similar tools) and social networking…I believe that we are getting close. A few days later a colleague sent me this post. Facebook is studying “sentiment” behavior. Right now it’s limited to things like how “nasty news is impacting stock” and when folks are “going out” but it can, and will evolve quickly. To this point, Zuckerberg has not really monetized his platform yet, unlike Murdoch with MySpace. So could this be the “killer” app that drives Ad sales into Facebook? It’s too soon to tell at this point but it sure sounds good. With 222 million unique visitors sharing very personal information with most of it in the public domain this might be the next piece to fall. Throw in Twitter and marketers will soon have the ability to understand what’s “hot” or has the potential to be “hot”, who says it’s “hot”, why they’re saying it, where they like to buy “hot”, etc.So the question to marketers is…if you have the opportunity in the near future to make your product the “hottest” thing…could you? You currently have the ability to access massive amounts of consumer data today and that will grow dramatically over the next few years. What are you doing with it now and what might you do with this information in the future? Posted on July 18, 2012 July 22, 2012 Categories 2009Tags data, facebook, marketing, productLeave a comment on Will Companies be able to Create a Trend?